In the spring of 2015 the St. Louis Public School district scheduled public open house of over 30 closed schools that had fallen into disrepair in the hopes that the schools could be redeveloped and re-purposed. 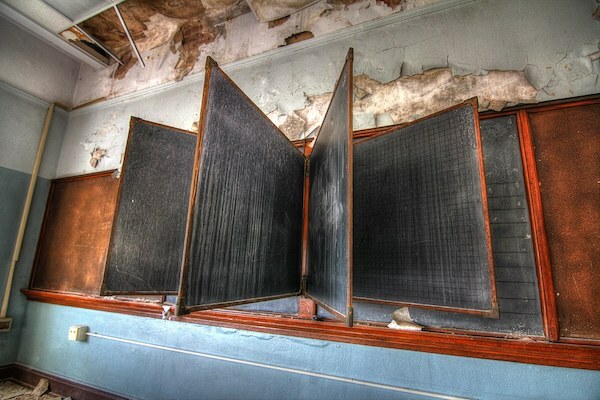 Local photographers descended upon the neglected, century old schools and spent a glorious spring photographing the beautiful chaos of cracked walls, peeling paint, mold, glass shards and dead animals. It is against this abandoned backdrop that eight photographers explored empty buildings and captured the emotive power of shuttered schools. The schools were looted, vandalized, thieves removed copper wiring and the freeze thaw cycle left many schools devastated. The architectural grandeur of turn of the century schools in ruins is heartbreaking and forces the viewer to reflect upon the emotional history of the building and the city that surrounds it. Back-to-school season is taking on new meaning in St. Louis as “Empty Halls, Silent Classrooms” photography exhibit opens one week before school starts. This powerful exhibit represents a physical manifestation of something that has gone horribly wrong. The strange sense of stillness in “Empty Halls, Silent Classrooms” offers compelling shapes in broken glass and unexpected intersections of shadow and light. Another Pike County Tour Today!